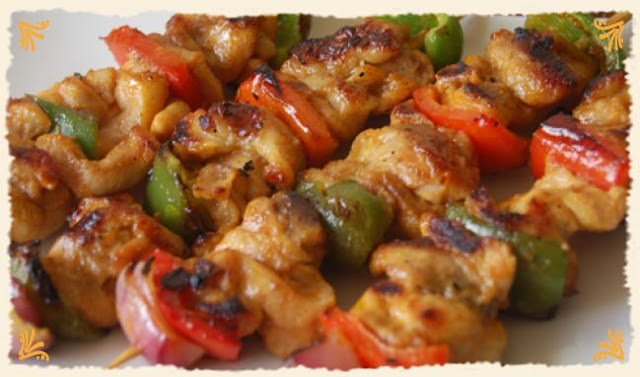 a stick of grilled chicken brochettes marinated in Mama Sita's Caldereta Mix, onions, red and green bell peppers. You may use lamb instead of chicken. Soak barbecue sticks in water to prevent the sticks from burning. 2. Thread 2 pieces of green bell pepper, 2 pieces red bell pepper, 3 pieces chicken meat and 1 piece red onion onto each of 10 sticks. 3. Grill over medium-hot coals until chicken is completely cooked, about 5 minutes on each side.